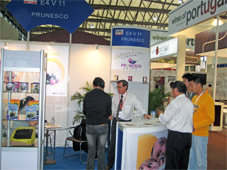 Prunesco, the largest exporter of dried prunes of Chile, had a successful participation in the SIAL Shanghai 2009 exhibition, one of the most important in Asia for food and beverages. The exhibition, which took place in the city of Shanghai, at the Shanghai New International Expo Center, between May 19 and 21, was attended by 1,057 companies from 50 countries that received a total of 28,528 visitors. Prunesco, one of the three Chilean attending companies, received during three days in the stand a large number of visits in order to present the company and its product offerings in the Chinese market. The show this year took place in an area of 40,520 m2 and received a 3% increase in public in relation to 2008, which came from 84 different countries.